ანდრე პრევინი (გერმ. 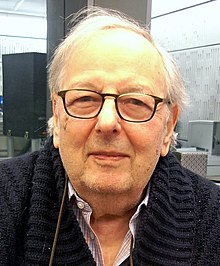 André Previn; დ. 6 აპრილი, 1929, ბერლინი — 28 თებერვალი, 2019, ნიუ-იორკი, აშშ) — გერმანელ-ამერიკელი პიანისტი და კომპოზიტორი. მიღებული აქვს ოთხი ოსკარი და ათი გრემი. ↑ Moss, Stephen. “Baton charged“, The Guardian, June 6, 2005. წაკითხვის თარიღი: September 6, 2009. ↑ Koseluk, Chris. “Andre Previn, Master of Many Musical Genres, Dies at 89“, The Hollywood Reporter, February 28, 2019.
ეს გვერდი ბოლოს დარედაქტირდა: 07:42, 1 მარტი 2019.